Microbloggers have poured scorn on a hospital that displayed a banner celebrating its 40,000th inpatient admission. The banner was noticed by a microblogger called Ming on Sina Weibo, He said that he'd noticed the banner while visiting his sick mother on November 29. Ming told the local paper that the banner was in poor taste and made him “feel sad and discontent,” so he decided to snap a picture and post it on Weibo. His post was forwarded by thousands of people online and many called it callous and insensitive. 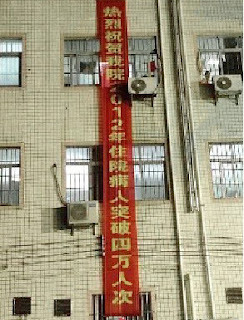 Within days, as the news of stye banner spread, it was taken down and instead banners proclaimed: "Congratulations to our hospital to the success of this year to exceed two hundred cases of laparoscopic surgery cases," "Congratulations to the hospital IT department for setting up outpatient workstations", and "Congratulations to our hospital for cataract the free surgical cases breakthrough nineteen hundred people. The Wuchuan City People's Hospital "propaganda" department said the number of hospital admissions had risen from 12,000 in 2006 up to 35,800 people in 2011.